XRP success depends on adoption. That’s why an increase in xRapid users is bullish for investors. Even still, the slide of XRP prices have been deflating, and after 12 months of lower lows, we expect Sep 2018 to guide medium to long term price trajectory. As long as SWIFT dominates, we expect determined competitors to step up their marketing, pitch to potential clients—mostly in areas where most are unbanked and without access to financial services. 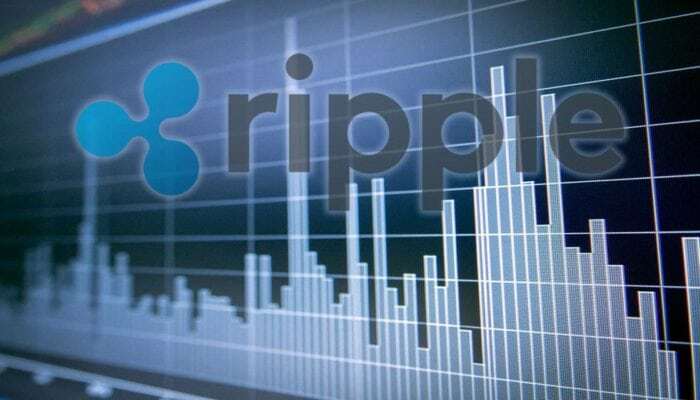 Such has been the effort of Ripple. With three main products—xCurrent, xVia, and xRapid, we can conclusively say they have been largely successful. However, they still have a long way to go. As a ledger that caters explicitly for financial institutions, the only way average investors will reap benefits is when majority banks incorporate Ripple’s technologies and adopt xRapid. The latter is a solution that guarantees speed, efficiency and cost saving made possible because it uses XRP as a liquidity tool. Thus far, 13 companies are benefiting from xRapid, but 13 is a mere drop in a cross border global payment system estimated to move $2 trillion by 2020. Should Ripple win over clients and there is regulatory clarity around XRP and xRapid, we expect demand to surge, lifting prices with it. 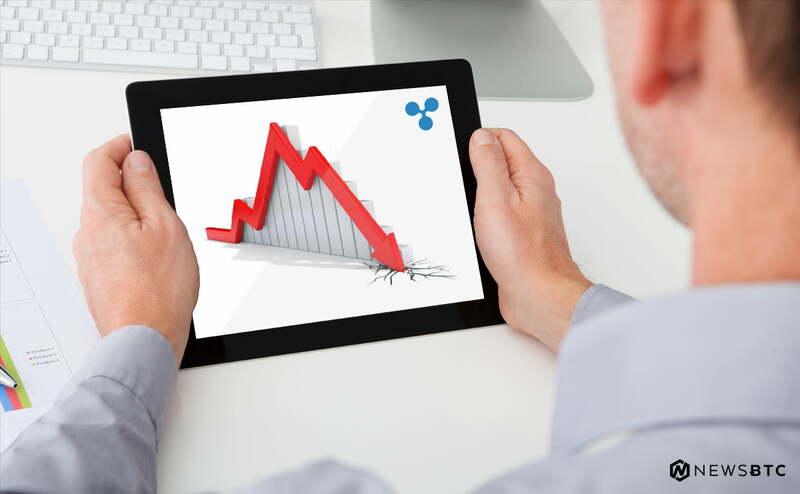 At the time of press, XRP was up 1.2 percent from yesterday’s close, exchanging hands at around 32 cents against the USD. Considering yesterday’s price sinks, this is positive and cements our previous assertions. However, conservative as well as aggressive traders ought to be on the sidelines until after our trading conditions are valid. Because we are net bullish with guidance from Sep 2018 surges, a safe approach is to wait until clear price swings are driving XRP above 34 cents. A simple Fibonacci retracement between Dec 2018 high low places this buy trigger line at the 50 percent level. That’s above Jan 20 highs meaning for the first wave of higher highs to hold then buyers must reverse yesterday’s losses preferably at the back of above average trade volumes—above 24 million. After that, the foundation for further gains towards 40 cents would be firm and conservative traders would be anticipating possible rallies towards Dec 2018 highs of 60 cents. 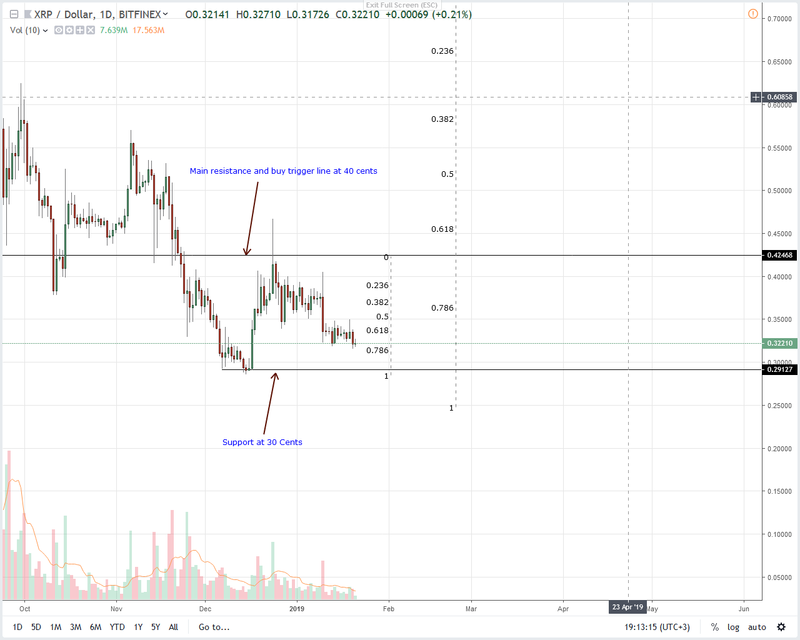 From a conservative approach, traders and investors would be tracking XRP buyers’ ability to reverse yesterdays and Jan 10 losses. With volumes of 83 million against 30 million averages, a bull buildup is necessary. To reiterate our stand, any volume surge driving prices above 34 cents (or below 30 cents) should exceed 24 million and ideally 83 million confirming demand or supply depending on breakout direction.